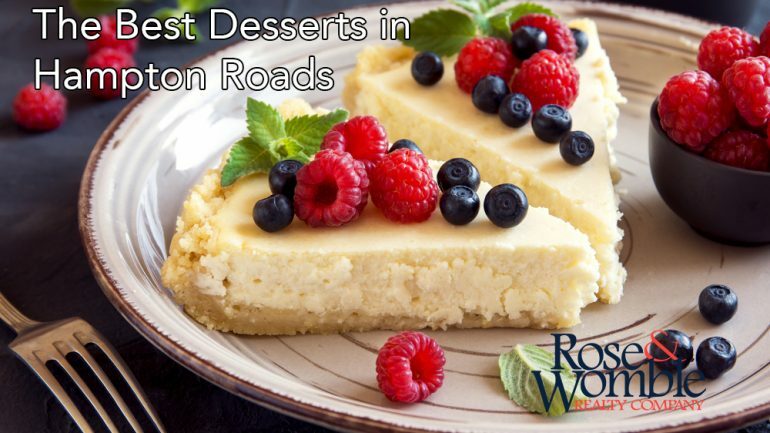 The Best Desserts in Hampton Roads - Rose & Womble Realty Co.
Take your pick from the lovely desserts at Nothing Bundt Cakes in Chesapeake. They also have a location in Newport News. I’ve heard great things about Sweet Kream Bakery. The pre-ordered cakes look fab, but the daily desserts are very tempting. For that true farm feel, along with those fresh pies, check out Bergey’s Breadbasket Bakery & More. They have a bakery, deli, creamery, and family activities (including a corn maze). Don’t miss your chance to check out this hidden gem. Williams O’Delicious is a cute, very clean store with a surprising variety. The cream puffs are fab, the daily cinnamon rolls and delicious, and the strawberry shortcake is magic. As a bonus, they make milk bread daily that will make your week. Follow their Facebook page for daily menu offerings. Inside the Port Warwick area, you can grab yourself a treat at Scratch Bakery. If you’re looking for rich and sweet, try their popular Gooey Bars. They have various flavors of cupcakes, all made with buttercream icing. Their often requested wedding cupcake (also available as a cake) is quite good, and has a hint of almond in it. Don’t miss the ice cream, either. It is brought in from a local farm. The butter pecan is a personal fave. They also have a location in Phoebus. Hummingbird Macarons and Desserts: This is one of those shops we have to visit often. If you love a macaron (not a macaroon), you should go by this shop. They offer daily flavors, but also rotate additional sensations through the week. But if that a macaron isn’t your favorite type of sweet, don’t worry, they have delightful delicacies awaiting. My personal fave there is the chiffon cake. It is fluffy and moist with a rich icing. Grab some tea while you’re there. Naas Bakery came up a few times when polling for tasty desserts, so I had to try them. I missed the often suggested bear claws as they sell out quickly, but I was a huge fan of the yellow cake with lemon buttercream icing and the mini pineapple upside down cakes. Though really mobile, Sweet Haven Baked Goods is out of Portsmouth. Their cupcakes are the bomb and they support a good cause. Riverstone Chophouse has a plethora of fancy desserts to make your mouth water. They have magically combined a carrot cake and cheesecake. Mmmmmm. Rigoletto Italian Bakery & Cafe has loads of tasty treats to tickle your fancy, but when we go, it is all about the biscotti. There are so many flavors from which to choose. You can sit and have some there along with your coffee, or (and) take a large amount home to savor later. While out of Virginia Beach officially, you can find products from My Vegan Sweet Tooth in various places. They’ve been known to do a pop up or two as well. And don’t let the name fool you. I’m in no way a vegan, but I do love their cookies and have heard great things about their cinnamon rolls. Look no further for your perfect cheesecake or HUGE slice of cake than The Route 58 Delicatessen. You can go in for a meal, but make sure you leave room for one of their special treats. Le Yaca, with locations in both Virginia Beach and Williamsburg, is a great place to go for those fancier French desserts. The Charlotte Citron, Coulis de Framboise was mentioned, as well as la Tarte Fine Aux Pommes. I have received rave reviews of the Jamestown Pie Company. Their most popular items include the pecan, apple, pumpkin, and bumbleberry pies. Grab a fork and dive in!